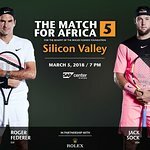 Tennis superstar Roger Federer agreed to play an hour of tennis Saturday Sept. 2 with the highest bidder for the Australian children’s charity, the Humpty Dumpty Foundation. The top prize for the highest bidder included an hour’s tennis with Federer and his coach, Sydney-based Tony Roche at the first annual Humpty Dumpty Ball as well as two first-class return air tickets to Dubai with Emirates and five nights accommodation at the world’s only seven star resort, the Burj Al Arab. The Swiss ace agreed to donate his time to the charity which raises money for medical equipment for a series of children’s hospitals. The money raised was used to purchase a piece of children’s medical equipment with Federer’s and the bidder’s names attached on a plaque.